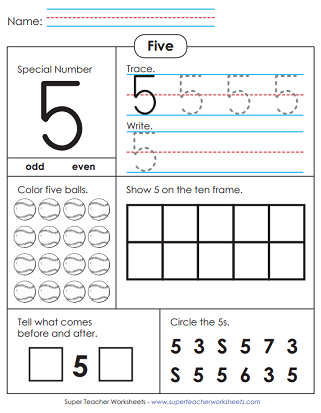 Below you'll find a collection of worksheets to teach number recognition and counting up to ten. Most of the worksheets on this page align to Common core standards K.CC.3 and K.CC.4. Trace and write the number 1 on the primary-rules paper. 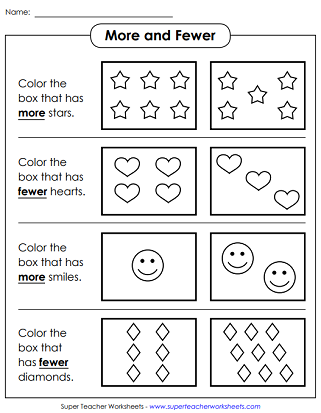 Then color one of the stars. Trace and print the number one. Then color or circle one elephant. Color one lion. Show one on the ten-frame. Tell what comes before and after the number one. Circle the ones. First students trace the number one. Then they try printing it on the primary-ruled lines. Your students can color and wear this number 1 crown. For best results, print this file on card stock. Make the number 2 by tracing and printing. Color 2 roosters and 2 hearts. Trace and write the number two. Then color in two whales. Color two apples. Show the number two with tally marks. Fill in the numbers on the number line. And circle the twos in the number box. Trace and print the number 2. Kids can cut, color, glue, and wear this awesome number two crown. Draw the number 3 on the primary-ruled lines. Then color 3 lions and 3 diamonds. Practice tracing and printing the number three. Then, at the bottom, circle three turtle pictures. Show the number three on a ten frame. Color three seashells. Tell what number comes before and after the number three. Trace and print the number 3. A large number 3 adorns the front of this headband craft. Carefully use a pencil to draw the digit 4. Then shade in four robots and four circles. Trace along the dotted lines to make the number four. Then write the number four on the primary-ruled paper. Then color or circle four ducks. Show the number 4 with tally marks. Color 4 whales. Tell whether 4 is odd or even. Circle the 4s in the box. Trace and print the number four. Here's a fun craft to try with your class. Make a neat hat with the number 4 on it. Here are five frogs to color in. Also color five stars. Then trace and print the number 5 on the wide lines. First, trace the number 5. Then try printing it on your own. After that, color five trucks in the picture at the bottom of the page. Color five baseballs. Draw five dots on the ten-frame. Circle the 5s. Tell whether 5 is odd or even. Trace and print the number 5. Your students will love coloring, making, and wearing these neat number 5 crowns. This one has pictures of dolphins and hearts. Trace and make the number six. Trace and print the number six. Then count and circle six ice cream cones in the picture at the bottom of the page. Color six toads. Make the number 6 with tallies. Complete the number line by filling in the missing numbers. Trace and print the number 6. Create and wear a fun hat featuring the number 6. Trace and write. Color seven giant whales and seven shiny diamonds. Trace the number seven and write it on the primary ruled lines. Then circle seven giraffes in the picture. Make seven on the 10-frame. Color seven cars. Circle the sevens. Tell if seven is an odd or even number. Trace and print the number 7. Your students will enjoying making this number seven headband to wear. Eight pigs! Oink oink! 8 circles! Teach kids to make the number eight. Learn to print the number eight. Then circle eight cars in the picture near the bottom of the page. Draw 8 tally marks. Circle 8 pens. Fill in the missing digits. Tell if 8 is even or odd. Trace and print the number 8. Kids will enjoy coloring and wearing this number eight crown. Number nine is very fine. Make some nines. Color the elephants and the triangles. Learn to write and trace the digit nine. Then circle nine pencils at the bottom of the page. Color nine pencils, circle the 9s, and make 9 on the 10-frame. Trace and print the number 9. Color, cut, glue, and wear this adorable number 9 headband. Color 10 octopuses and ten triangles. Trace and print the number ten. Learn to print the number ten. Then, at the bottom of the worksheet, identify ten butterflies. Color in 10 stars, draw 10 tally marks, tell whether 10 is odd or even, and fill in the missing numbers on the number line. Kids can make a "number 10" crown to wear in the classroom or at home. Trace and print the number 0. Trace and print the number zero. The color the zero. Trace and print each number from one through twelve. Match the picture card with the number card in this memory game. Trace the digits. Then color items to answers the counting questions. Write the numbers 0 through 10. Then count the dots and match the numbers. Color 9 circles. Color 4 stars. Color 8 hearts. Color 6 squares. Write the number of hearts shown. Color the square with 6 dots in it. Color 8 circles. Write how many stars you see. Count to ten and write the numbers in the circles to help the butterfly reach the flowers. Write the numbers 1 to 10 on these cute caterpillars. Use an ink dabber (bingo dabber) or a crayon to add sections to the caterpillars. Count the boats, trucks, planes, cars, trains, and bicycles. Count the ants, bees, worms, and butterflies. Count the sheep, goats, cows, horses, and chickens. Count the fish, cats, dogs, rabbits, hamsters, and turtles. Count the stars, planets, comets, rockets, and space creatures. Count the brownies, cupcakes, bagels, donuts, cookies, pies, pretzels, and loaves of bread. Cut this page in half an attach the parts together to make a large number line with numbers one through ten. Count to find the number of red circles in each ten frame. Draw the correct number of counters in each ten-frame. How many more counters need to be added to the ten frame to make 10? Red and white counters are shown on 10-frames. Write an addition/subtraction fact family for each. Tell the number of dogs, birds, turtles, cats, snakes, and rabbits. Cut apart the pages and assemble the miniature book. Color and count the pumpkins on each page. Count the dots and color the picture according to the key. Color the numbered areas in the picture according to the key. Students color the areas in based on the key found on the bottom of the page. By coloring the areas according to the color key, students reveal a fun robot! Match the numbers in the mystery picture with the colors on the bottom of the page. Hot air balloon coloring mystery picture. Color the colors according to the number key to reveal a clownfish picture. Count to 10 by connecting the dots. The finished pictures is a fish. Kids can color it in when they're done. Connect the dots to make a pig. Color it pink. Make a picture of a star shooting across the solar system as you count from 1 through 10. Learn the difference between the words more and fewer. Count the objects in each box. Tell which has more, and which has fewer objects. Circle the box that has the greater/less number in it. These number word cards can be used in your classroom pocket charts or on your word wall. 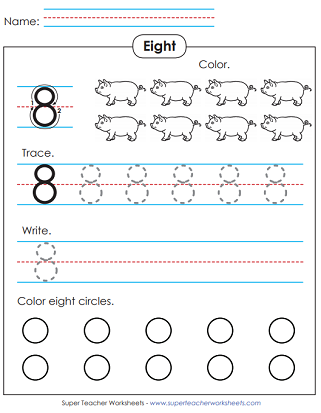 On this page, you'll find lots of printable worksheets and games to teaching number recognition and counting up to 20. Here you'll find lots of STW activities for teaching number recognition and counting up to 30. This page has worksheets and activity mats with 5-frames, 10-frames, and double 10-frames. On this page, you can print out 100 charts, 99 charts, and 120 charts.